Sunday Morning Adult classes begin with fellowship and coffee at 9:15 AM. We offer a wide variety of class choices. Please call the church office for a detailed listing. Various Home Study Groups meet in different parts of the greater Waco and outlying areas. These groups share God's Word and have food and fellowship. Check the worship folder each Sunday for times and locations. This study meets on the 1st & 3rd Wednesdays for study and fellowship at 9:30 am at the church. This study meets on Tuesday mornings at 6:30 am. Men learn to grow in their Christian life through the study of God's Word. Start your day off right by learning Scriptural truths and a good, hearty breakfast and fellowship. This worship setting in conducted on the 2nd Wednesday of each month to enjoy fellowship together. A worship service with Holy Communion begins at 11:00 am and is followed by a meal in the Family Center. Seniors, if you enjoy food, fellowship and faith, this is the place to be. This class is offered at various times during the year (usually quarterly). This class explains the teachings of the Lutheran Church - Missouri Synod. People new to the Lutheran church will find this to be exciting and informative. Long time members will find this to be an excellent "refresher" course. Sunday School classes meet every Sunday Morning at 9:15 am and is for all ages (nursery through adult). 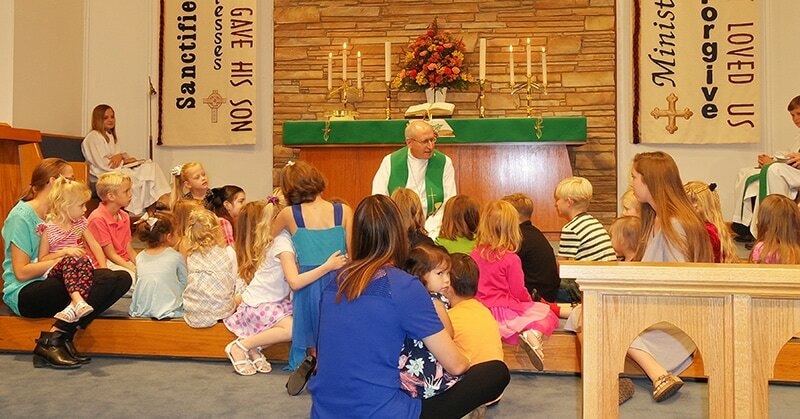 This is a cooperation of parents, pastors, teachers, students, and congregation to prepare young people for the Rite of Confirmation and confirmed membership in the Lutheran Church. These classes meet on Wednesdays September thru April.